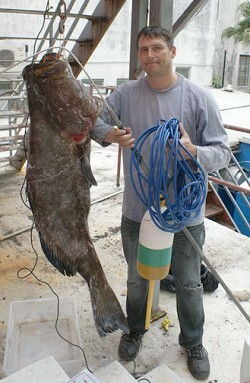 A spearfisherman from Bermuda has broken the world record for the biggest Black Grouper catch. Craig Copik tackled the 87.3lbs monster a couple of miles west of North Rock to claim the title. The 36-year-old Brit, who works at Bermuda Maritime Operations Centre, was dragged 50 feet under water, after spearing the fish. How he did it Copik: “I was out with a friend, Tim Cooper, scouting for good locations that we could go to for a spearfishing tournament that was taking place a week later. “We were probably eight miles off North Shore and I had just caught a White Margate when I spotted the tail of a big fish sticking out from the reef form. “I snuck up behind the fish and shot it. “He took me down around 50 feet and went under a shelf. “I then had to go back to the boat, pick up another spear and swim down again to bring him back to the surface. 5-Minute breathhold “It was not as hard as some of the fish I have speared. I have done a lot of training to hold my breath for long periods of time. “I can go down to around 116ft and hold my breath for five minutes, so being taken down to 50ft was not too bad. “But the adrenalin was pumping because I knew it was a big one. “It was not until we got back in and weighed him that we realized we had the record.” The previous Black Grouper record stood at 86.4lb and had been set by a spearfisherman in Mexico Mr Copik had to get the weight of his fish certified at Fly Bridge Tackle in Hamilton and then send off the details to the International Underwater Spearfishing Association (IUSA).